As soon as I saw the “Not Now” table by artist Michael Beitz over at Fubiz.net I knew I found my next dining table. Of course the only problem is finding room for it in our current house. I’m not even sure it’ll fit in the doorways, but man it would be awesome to have it installed by Thanksgiving! 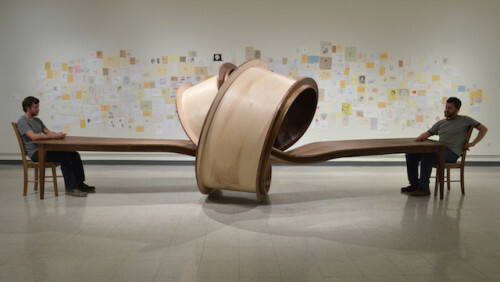 While you’re checking out all the other images of Michael Beitz’s “Not Now” table at Fubiz.net take a look at another gallery of twisted furniture from designer Kino Guerin. Now if only I could find the right table cloth to go along with it.